Cyclone REGISTER 360 goes perfectly with your Leica ScanStation or BLK360 imaging scanner. Go from raw data to fully registered in just a few clicks. In a matter of minutes be on your way to delivering a registered data set, sharing TruViews with clients or colleagues or creating downstream deliverables in your favorite CAD or BIM software with Leica CloudWorx. Simple. With industry exclusive drag-and-drop as well as wireless import, auto-registration, and QA/QC at every turn. Fast. Batch export and publish features, and the industry’s first comprehensive registration report. Scalable. Whether you need a handful or hundreds of scans registered, REGISTER 360 can handle it. 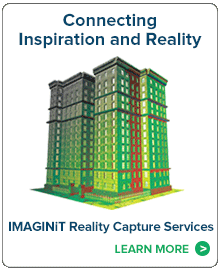 Our reality capture experts can walk you through the options and processes for collecting and registering scans. Let us know how we can help you make the most of your technology.